Wait, isn't that the beast Ram truck? There was a 20 car pile up of completely totaled cars in San Antonio, really bad. at least they could see your place from there… with a little more effort it could have been sitting solidly on the frame all the way around… makes getting in and out of the cab easier I suppose… about 600 lbs of mud welded to it? Watch that winch cable. Bumper jacks are invaluable in situations that this. I freed my diesel suburban from a ditch that left me on the frame like this, near Grapeland, TX about 4am back in 1995. Two separate lifts to the top of the jack, and shove it over, it was free. Did others like that also. If it doesn't readily tow/winch with ease. Place lumber/big rocks etc, under the rear tires after jacking also. Kinda leery of cable snaps unless it's a big one. Are any of you guys ham radio operators? Looks like a great place for everyone to carry a little 2m handheld...about 50 bucks. Been at it since high school myself. KC5YSQ got that when I lived in Katy, kept it ever since. 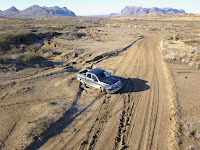 Many years ago I tried to take a new 1999 Ford Super Duty F250 diesel 4x4 across a damp looking creek crossing on the Terlingua Ranch. 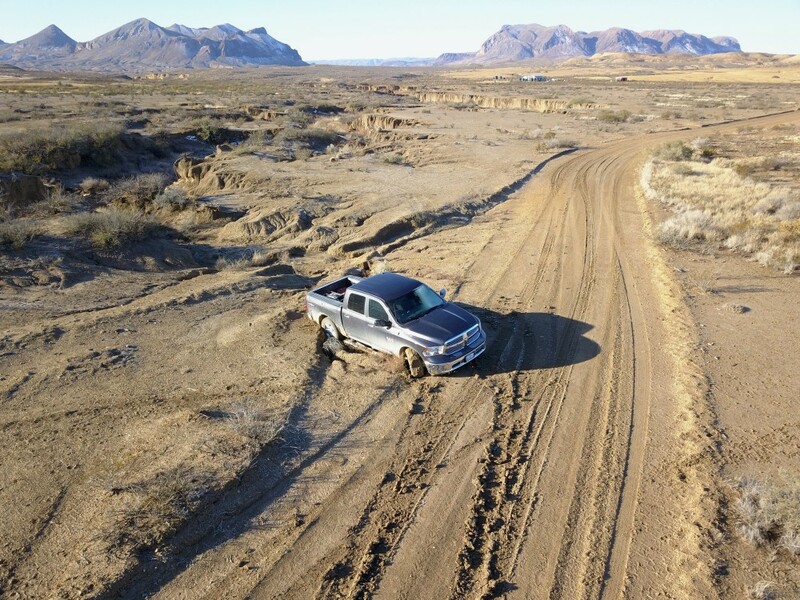 Remember there are NO BRIDGES on 1000 miles of dirt roads. It sunk down to the frame. Took two wreckers to pull me out & $500. Never made that mistake again. John Wells road has an even worse material - when it gets wet. I is called bentonite & you sure do not want to try your 4x4 on it - when it is a little damp. Do like John says - wait till it dries out. Update...successful rescue from the mud on Sunday afternoon. Took all of 5 minutes. Did you clean off his 'backing up' mirrors:) so he could see the ditches next time? Actually...he was backing up once he hit a really bad spot in the road hoping to get back to dry ground to turn around. 20 more feet and he would have made it but the road took over and sucked his truck into the ditch.